The first annual Rejoice Easter Festival has attracted thousands of faithful and locals, who described the event as a resounding success by its organisers, the Youth Association of Sydney. The Festival was the first of its kind to be organised by the Assyrian Church of the East with the purpose of celebrating the resurrection of our Lord and Saviour Jesus Christ. 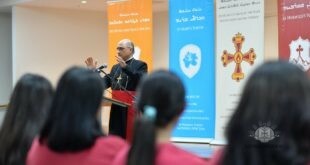 Taking place on Easter Monday, 9 April 2012 at St. John’s Park High School, the official program opened with a prayer offered by St. Hurmizd Church’s Sunday School. The day was filled with fun rides and amusements, appearances by popular Disney characters such as Belle, Tinkerbell, as well as superman and of course the festival’s friendly clown. Later in the evening, well-known singers and entertainers took to the stage and performed for hours, leaving everyone to dance the night away. Official “Rejoice” merchandise and Easter show bags were especially thoughtful, with their Christian-centered contents aiming to bring back the true meaning of Easter. Lucky door prizes were drawn, guessing competitions on Easter eggs were announced, and ceramic and arts competitions entertained the large turnout of children throughout the day. Parishioners loved the entertainment, while the cultural food left the attendees with a fulfilled appetite; thanks to the collective Assyrian Church of the East Ladies Committees. A thank you note by the Youth Association’s Event Organiser, Reema Khammo, was presented thanking the attendees for their support. The night concluded with a beautiful display of fireworks against the encouraging backdrop of St. Hurmizd Cathedral. The Youth Association of Sydney hope to see everyone next year for their second annual Rejoice Easter Festival.